demography.matters.blog: As Good As It Gets In Latvia? As Good As It Gets In Latvia? For Maurice Pialat, champion of the marginal centre. "This raises a final question, which, while not central to the issues of this paper, is nevertheless intriguing: How can a country with a low minimum wage, weak unions, limited unemployment insurance and employment protection, have such a high natural rate [of unemployment]?" "To summarize, the actual unemployment rate is still probably higher than, but close to the natural rate of unemployment. Latvia may well want to take measures to reduce its natural rate, but the recovery from the slump is largely complete." With these words three IMF economists (hereafter BGG) effectively signed off on their study of "what just happened on Latvia" and, they hoped, drew to a close a debate which has been going on now for some 6 years. In fact, far from closing the debate, what they may have done is effectively extend it into new terrain, since these apparently harmlesss words - "the recovery from the slump is largely complete" - have far reaching implications, as does the methodology they use for reaching it. These implications reach well beyond Latvia, and even far beyond the Baltics and the CEE in general, despite the conclusion that everyone seems to be reaching that Latvia was just a "one off". Possibly without intending to do so, they have drawn onto the clinical investigation table issues which have been mounting up in the theoretical lumber rooms of neoclassical growth theory for some time now, issues which begin to assume a paramount practical importance in the context of our rapidly ageing societies. What, for example, do we understand by the term "convergence" these days? And if "steady state" growth can no longer be understood as implying a constant growth rate (trend growth in developed economies is now systematically falling) should we be considering the possibility that headline GDP growth will at some point turn negative, even if GDP per capita may continue to rise, due to the fact that populations are steadily starting to shrink. And if the answer to the former question is "yes", then what are the implications of this for the financial system, for the system of saving and borrowing, and for the sustainability of legacy debt? Not little questions these, but ones which will need to find answers and responses in countries like Latvia over the next couple of decades. And again, returning to a question I raise about Ukraine (here), while Latvia's recovery may be complete and thoroughgoing, what satisfaction can we really take from our knowledge of this when - according to the country's President Andris Berzins - the end state leaves the very survival of the country as an independent entity ten years from now as an open question? The problem - the country's population is falling, along with its workforce, and young educated Latvian's continue to leave looking for a brighter future elsewhere, even if they now do so at a slower rate than they did during the height of the crisis. 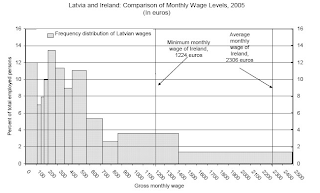 "It is generally recognised by most external observers that this malaise has its origins in structural problems in the Latvian labour market, and it will be argued here that these structural problems have their roots in recent characteristics of Latvian demography (namely high out-migration and a sustained low birth rate). As such there is no easy solution. Even in the longer run the position will inevitably be difficult, since demography almost inevitably casts a long shadow. This does not mean, however, that we should be complacent. There are steps which can be taken to address the issues which Latvia faces in the short term, and it is important that such appropriate measures are enacted. These measures clearly include policies to reduce the dramatic overheating which is taking place, but they also should include policies to loosen the labour supply, not only by encouraging increased labour market participation and mobility, but also by actively encourage inward migration. Such policies may be seen as short term measures which are vital to move Latvia away from an unsustainable and towards a sustainable economic path." 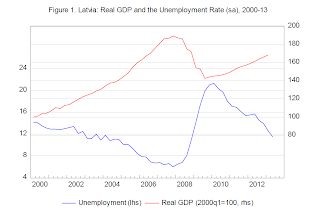 "The basic and striking facts to be explained are given in Figure 1 (see chart reproduced above - EH): An increase in GDP of almost 90 percent from 2000:1 to 2007:4, followed by a decrease of 25% from 2007:4 to 2009:3, and a recovery, as of 2013:1, of 18 percent. A mirror image in terms of unemployment, with a decrease in the unemployment rate from 14% in 2000:1 to 6% in 2007:4, followed by an increase to more than 21% in 2010:1, and a decrease since then, down to 11.4% in 2013:2." "As a matter of arithmetic, the result of increasing consumption and investment ratios was a steady deterioration of the current account balance, with the ratio of the current account deficit to GDP increasing from 5% of GDP in 2000 to peak at a very large 25% in mid-2007." 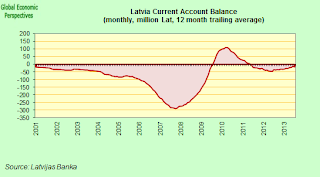 So it is clear the Latvian economy was running above capacity, but how much above capacity? This is really what the present debate is about, since depending on the answer you give to that question the estimated current trend growth level of the country will be either higher or lower, as will the non-inflationary unemployment rate. 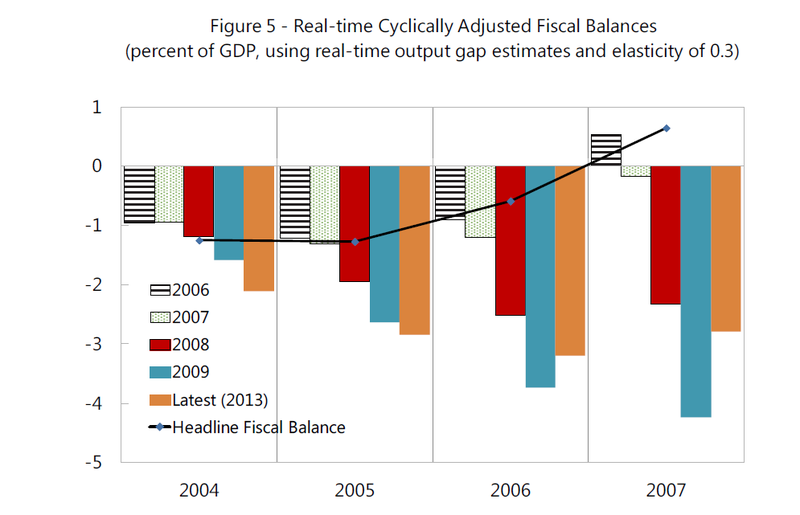 Using various vintages of output gap estimates taken from real time EU Commission economic forecasts (12% positive in 2007 as estimated in 2013) the authors derive a series of cyclically adjusted fiscal balances which show how, at least from the current vantage point, the size of the output gap, and hence the degree of laxity in the fiscal stance, was systematically underestimated. In 2007, for example, the EU Commission only thought the positive gap (ie degree of overheating) was some 3%. Well its always easier to see things more clearly with hindsight might be the common sense response. Would that things were so simple! What is involved here is a really important and hard to resolve methodological (and even, god help us, epistemological) issue (especially in countries which pass thorough a deep and protracted economic slump) - what is the special privilege of the present as a valid vantage point, when compared with the virtual infinity which time will eventually offer us? After all, in the "present" which was 2007 things did look very, very different. Perhaps our current evaluation of our own "present" is just as conditioned as earlier perceptions of earlier "presents" were. The problem is we are using our present appreciation of the way things are to reach conclusions about the past which may look very different in some other, future, present. Yes, you're right, there is an element of circularity in the kind of argument that is used by BGG. As the people in the trade put it, potential output is an unobservable latent variable, you know, a bit like the Higgs particle, something you can't see or measure, but which you have to assume to exist for everything else in your theory to make sense. As one of the IMF authors, Bertrand Gruss, puts it in his paper on the topic, there are "many different methodologies" which can be used "each of them encompassing a different precise definition of potential output and entailing advantages and disadvantages". All of them have, however, one thing in common: "potential output estimates are subject to substantial uncertainty." As he also notes, in the case of a country like Latvia, emerging from a substantial slump, the degree of uncertainty is especially large. So those who would use the arguments in BGG to argue something simplistic, be chastened, the room for error is large. But then "substantial uncertainty exists over the past and future" doesn't make for good headlines, and, perhaps more importantly, doesn't inspire confidence in the policymakers who admit this. So does each historical moment have its own special "truth" as far as potential output goes? This point - present moment bias - is described by Paul Krugman like this: "These methods automatically interpret any sustained decline in actual output as a decline in potential, and they cause that re-estimate to propagate backward through time." This approach could be described as "present moment reductionism" in the sense that events in the past are viewed and evaluated from the standpoint of the present, in a way which makes them explicable and comprehensible only in terms of the present they give rise to. The German philosopher Liebniz once put it this way, we live in "the best of all possible worlds", if not in the best of all imaginable ones (back to Tarkovsky's room). Basically, it is difficult to avoid the bad performance generated during the slump "contaminating" the data. What we really need is information on Latvia's future performance, then we could situate the present. We need a time series from the future, then we could see much more clearly what is happening now. Unfortunately for us we can't have access to one. The "set up" (or world) we live in has this characteristic.On some views this is precisely what makes it interesting. At the same time recognising this reality doesn't make the problem simply go away. As macroeconomists we are constantly forced to make what come near to being ad hoc judgements, and we need to do so time and time again, as we go forward and on the fly. As the Spanish poet Antonio Machado put it, "el camino se hace andando" - we make the path we walk along as we walk. The difficulty is that we are in a bit of a "garden of forking paths" here, since the decisions taken in 2008 and 2009 are the reason we have reached reach the endpoint we are at now, and it is this (momentary) endpoint which conditions our judgement about the initial conditions we set out from. And this is the case even though, had we taken another path at the outset we would surely have arrived at another "now" from whence the starting point would have been seen differently. Growth theory was invented to provide a systematic way to talk about and to compare equilibrium paths for the economy. In that task it succeeded reasonably well. In doing so, however, it failed to come to grips adequately with an equally important and interesting problem: the right way to deal with deviations from equilibrium growth........if one looks at substantial more-than-quarterly departures from equilibrium growth........... it is impossible to believe that the equilibrium growth path itself is unaffected by the short- to medium-run experience.......So a simultaneous analysis of trend and fluctuations really does involve an integration of long-run and short-run, or equilibrium and disequilibrium. As he says, it is impossible to believe that the longer term path of the economy is unaffected by the trajectory taken during the deviations from trend - whether upwards or downwards. (Incidentally, I used the comparison with Liebniz above because it seemed appropriate, because it seemed to me that Liebniz's "rationalisation of the real" was exactly what is going on here. This attitude was famously satirised by Voltaire in his Candide. Curiously when I went back to the Solow speech to dig the above extract out what else did I find - a reference to Candide. Happy to be in good company). "Many different methodologies have been used to estimate potential output, each of them encompassing a different precise definition of potential output and entailing advantages and disadvantages. No specific approach can be taken to be “the” correct one and potential output estimates are subject to substantial uncertainty. This uncertainty is probably even larger for countries like Latvia, a transition economy still going through substantial structural changes and coming out of a severe crisis that has likely rendered obsolete a significant part of the economy’s productive capacity." 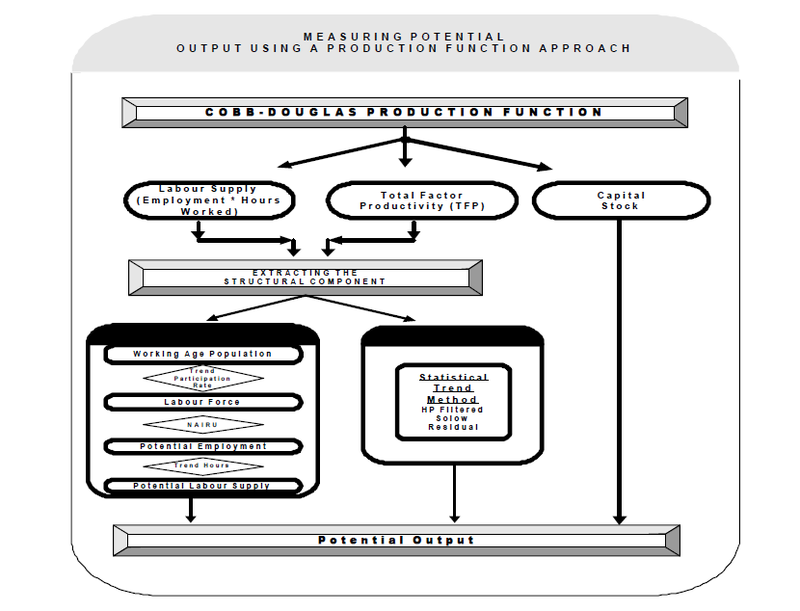 For technical reasons which we don't need to go into here, BGG decide to use a production function methodology broadly similar to the one in the diagram above (click on image for better viewing), which is in fact the one they use over at the European Commission (Roeger, 2006) where they got the 12% 2007 output gap result. In fact the IMF variant isn't identical. Their result (at least as of last January when the study was reported): "Output was probably about 5–10 percent above potential before the crisis, although the extent of overheating at the pre-crisis boom is particularly uncertain." Just to give us a feel for the kind of range of certainty involved here, Bertrand Gruss concludes his results by stating the following, "While acknowledging the uncertainty of estimates, staff believes output was significantly above potential before the crisis, but probably in the 5–10 percent range rather than in the 15–20 percent range". More important than the actual result in my opinion is how they achieved it. A quick inspection of the left hand path in the diagram will reveal that a very significant part of the calculation revolves around labour inputs which ultimately depend on demographic dynamics. 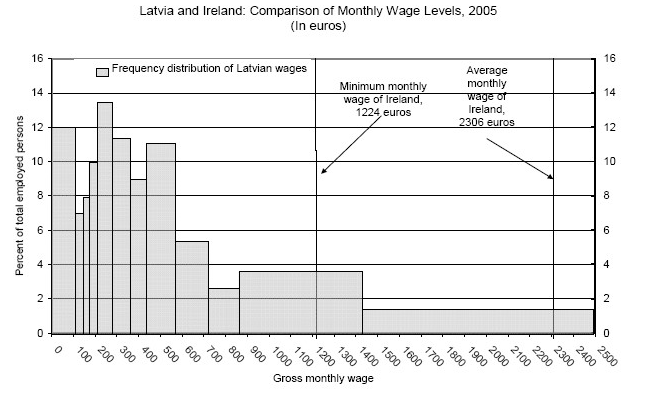 Indeed Gruss justified his preference for the production function approach precisely for this reason: "The emphasis on a production function approach reflects both staff view that it represents an adequate framework for Latvia (where, for instance, population dynamics and structural unemployment play an important role in potential labor and potential output estimates)....". Put simply the only real positive impetus to trend growth we can expect in the future from Latvia will be on the TFP side, since the labour input component will turn negative at some point (if it hasn't already done so). Bertrand Gruss in fact puts it quite bluntly: "Labor is not expected to contribute to potential growth in the coming years." Now, quite coincidentally, the IMF is finally getting round to thinking about the demographic side of the European periphery problem (not sure why it took them so long since they've been using the kind of production function methodology described above for years). Well, at least in the Latvian context it is. I say "finally" because for whatever reason there seems to be some sort of resistance among fund economists to thinking about demographic issues (including migration flows) as part of the core macro picture, yet as can easily be seen above it really is, and Robert Solow wouldn't doubt it for a moment. Anyway, their current thoughts on the Latvian demographic outlook can be found in the form of an appendix to their 2012 Latvia Article IV consultation report. Coincidentally this report was published at the same time as the second part of their program monitoring reflections, ie the signal being given would seen to be that while demography is important, it is an "issue pending" which can be safely passed over to the post program environment. This is in complete contrast with the methodology being advocated here which is that the program should in part have been designed with this central issue in mind. I have been advocating this since 2007 and I will continue to do so. Be that as it may, as they inform us in their appendix, Latvia’s population is shrinking rapidly. Low fertility: the decline of the population for natural reasons was about 125–140 thousand people (5 percent of the population). The number of births has halved since the early 1990s—from around 40,000 annual births to around 20,000—falling below replacement levels. 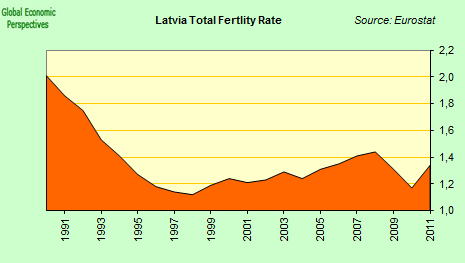 In fact saying that fertility has fallen below replacement levels is putting it mildly, since the Latvian fertility rate is currently around 1.3 (one of the lowest in the EU) and has been effectively below replacement since the country came into existence. The number of births has been falling more rapidly since the onset of the crisis due in part to the harsh economic conditions but also aided and abetted by the fact that the majority of the women emigrating are of childbearing age. So Latvia is facing a massive challenge. A combination of low fertility and emigration mean that the population is shrinking rapidly and at the same time ageing. The proportion of over 65s is set to surge between now and 2030 as it is all over Europe. Naturally with the hole in the pyramid left by the "missing births" and the working-age-population migration-loss the country is bound to be an example of one of the worst case scenarios, far worse than Japan, since Japan has only been resisting immigration, it has not lost population through emigration. Fortunately, the country has a possible solution - it belongs to the EU, is about to join the Euro, and the possibility exists that the Euro Area will become a transfer union over the next decade. At least that's the theory, I don't doubt the reality could well be different. But really the creation of this transfer union is Latvia's only hope now, and obviously it would be a substantial net beneficiary, since otherwise it is hard to see how the country will be able to offer its elderly population modern minimum standard welfare services like health and non-poverty-inducing pensions. Actually BGG do try and address some of these issues. They do so since, as they say, "an important part of the adjustment has taken the form of emigration". 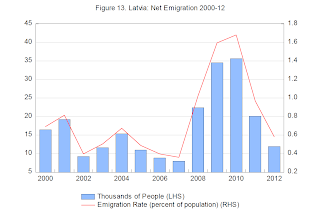 As they also point out Latvian emigration long predates the crisis. The average net emigration rate was 0.5% from 2000-2007. It increased to an average 1.3% from 2008 to 2011, but by 2012, was roughly back to its pre-crisis average. So emigration isn't a product of the crisis, it was simply made worse by it, but still, and going back to Solow ( it is impossible to believe that the equilibrium growth path itself is unaffected by the short- to medium-run experience.) how far was Latvia's longer term future being put at risk by the form in which the adjustment occurred. [Just as a side issue it is worth noting that exactly the same question arises in the context of the Greek adjustment. Had the IMF forced the EU to accept debt restructuring and an EFF rather than the initial SBA, the pace of the fiscal adjustment could have been slower, and the loss in output lower. Mein Gott, we might not now be talking about a current estimate of a Greek output gap of plus 10% in 2007 (if you follow the logic of the argument advanced earlier). See my "Second Battle of Thermopylae" post]. "The question however is whether this emigration is, in some sense, a failure of the adjustment program. In the United States, migration rather than unemployment is the major margin of adjustment to state specific shocks ..... These adjustments are typically seen as good, indeed as the main reason why the United States functions well as a common currency area: If there are jobs in other states, and if moving costs are low, it is better for workers to move to those jobs than to remain unemployed." This is an argument that it commonly advanced in the context of Euro Area issues (let's leave aside for the moment the fact that Latvia wasn't in the Euro) - in an optimal common currency area this sort of labour mobility is a good thing. In addition let's leave aside the question that Europe isn't the United States, that it is a continent made up of nations, and that these nations form part of our identity as Europeans in a way which is hard to quantify economically and in a way which can't simply be wished away by waving a magic wand (or paying another visit to Tarkovsky's room), the fact of the matter is that the Euro Area isn't an optimal common currency one. At least institutionally it isn't. To become one of those it would need to have a common treasury and a common unemployment benefit and pension system, etc. Unfortunately, this is an issue which BGG, like so many before them, simply slide silently past - "the largely permanent departure of the younger and more educated workers may indeed be costly for those who stay" - like a ship in the night looking for open water while at the same time carefully evading the enemy minefield. "Is the answer [to the above question:EH] different for a small country than for a US state? Some economic aspects are different: Some of the costs of running a country are fixed costs, and thus may not be easy to support with a smaller population. In the United States, many of those costs are picked up by the Federal government (although, as we have seen for Detroit, the remaining fixed costs per capita may become too large for a state or a city to function). This is not the case for a country, which must for example finance its defense budget alone." The reference to Detroit is of course salutory (this is exactly the problem), although it is curious that the example they take for the fixed costs of having a separate state is defence, an area where Latvia obviously benefits from the existence of external institutions like NATO and the EU. Again, the extent would be hard to calculate, but one of the factors which must have influenced Latvian's in their decision not to offend their EU partners by devaluing the Lat must have been a consideration of just this issue. Still, the question remains, from a demographic point of view could things have been done differently? It's very hard to give a conclusive answer. My argument in favor of devaluation was always based on the potential demographic dynamics which it might induce. 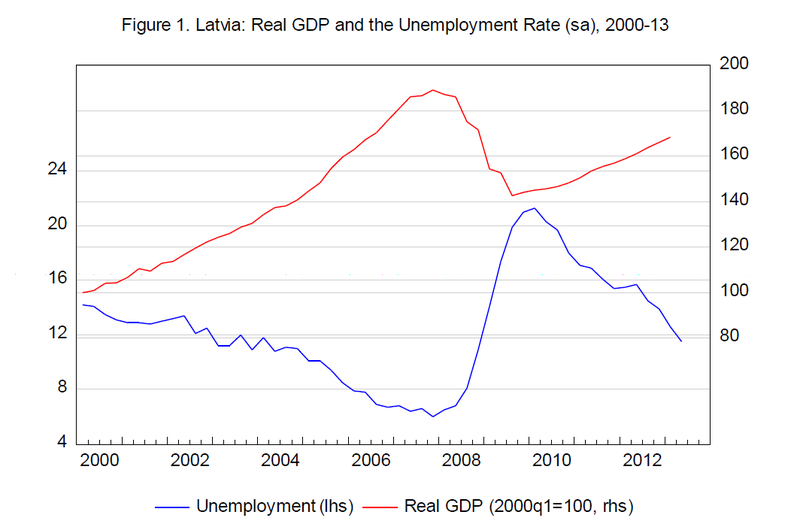 Obviously there would have been a large drop in output, but Latvia had one of those in any event. Would less people have migrated out? That is very doubtful, and indeed, as BGG point out, people were emigrating even at the height of the boom. But then again, would the post crisis potential growth rate have been higher? Would the country still have had to face a non inflationary unemployment rate of 10%, or would the additional international competitiveness achieved have meant it was much lower? Would immigrants be arriving to do some of the lower skilled work? The thing about this last point is, more than just ending the emigration what Latvia really needs (like Japan, like South Korea) is immigration to shore up the population pyramid, to make the welfare system sustainable in the longer run, especially since although the country's future currently depends on the creation of an EU transfer union there is no guarantee there is actually going to be one. It is unlikely that the emigration hemorrhage would have been avoided even with devaluation - large numbers of Argentinians, for example, arrived irregularly in Spain in 2002 and 2003 and the two countries weren't in any kind of bilateral Schengen arrangement. But would the natural rate of unemployment have been different following the adjustment? We will now never know. However, an argument from two of my Economonitor colleagues - Andris Strazds and Thomas Grennes - should give us some food for thought. According to these authors, when it comes to emigration dynamics "Unemployment Matters Much Less Than Relative Income Levels". Now despite the fact that one might have some reservations about the actual methodology they use (they seem, for example, to confound the migration component in population dynamics and the birthrate one where in fact these are quite distinct channels) they are certainly digging in the right area, as the following chart which comes from a pre crisis IMF report makes clear. The problem, of course, isn't only relevant to Latvia. Despite the fact that Spain's unemployment rate is currently around 27% immigrants continue to arrive in the country (often risking their lives to do so), a fact which puzzled the Financial Times demography correspondent Norma Cohen when we spoke about this article. "Why on earth," she asked me "would people want to come to Spain with such a high rate of unemployment?" Because salaries are better than in their home countries would be the simple answer, and because they are willing to do work which many Spaniards are reluctant to do, at least at the salaries which are on offer. So economic migrants continue to arrive, an estimated 300,000 of them last year, even though the net migrant flow reversed since more left (both native Spaniards and immigrants) with Spain's population falling for the first time in modern history as a result. The idea of "centre and periphery" seems like a useful analogy here, since more than simple emigration or immigration what we seem to have is a steady displacement of population with migrants of lower skill entering one side of a country while higher skilled natives exit across the other. In this sense one can truly speak about "population flows". Naturally the net human capital loss involved is substantial. Italy had some three million immigrants during the first decade of this century, but the overall annual rate of growth was not much above zero. Beyond implementing the maximalist programme of a completely federal Europe with population moving in one direction and transfers moving in the other it is hard to see what the solution is here. The general consensus seems to be that Latvia is an interesting case study, but one where the lessons learned have little application beyond the country's frontiers. I'm not sure I buy this. Let's start at the beginning. In short, the anticipation of a large scope for catch up growth, together with cheap external financing, led to an initially healthy boom. As time passed, the boom turned unhealthy, with overheating leading to appreciation and large current account deficits, with lower credit quality, and with balance sheet risks associated with FX borrowing. First of all, on a conceptual level, how does an economy get to operate far above capacity? We understand operating below capacity: producers may fail to produce as much as they want to if there isn’t enough demand for their products. But how does excess demand induce producers to produce more than they want to? I think part of the answer here is that we all generally thought that in an epoch of large scale globalisation with extensive migrant and fund flows "open" really did mean open, in the sense that to erect a well functioning economy all you needed was a large strip of land (of which Latvia has plenty), cheap tax rates and flexible labour laws, then the entrepreneurs, the capital and the labour would all flow in. The problem in Latvia's case was they didn't. The capital was there, so were the entrepreneurs, but one of the other factors was in short supply, and indeed instead of flowing in it was flowing out. Then bang! That's over-simplifying a bit, but it is the bare bones of the situation, a situation which surely has lessons to be learnt for other CEE countries (or far flung places with similar underlying demographics like Vietnam). In particular the word "Ukraine" comes into my head. But beyond this, why was all that capital flooding in to finance something which to the careful eye was evidently not working? My reply would be, and taking us back to the literature of the time, the operation of the Global Financial Accelerator, a term coined by the Danish economist Carsten Valgreen to describe what was happening in Ireland and Latvia before the crisis actually hit. Essentially, in an environment of ample global liquidity being generated by central banks in countries which don't have the capacity to absorb all the liquidity phenomena like Latvia and Iceland simply happen, as we have been seeing in recent months as the Fed tapering debate lead to a sudden stop in one Emerging Market after another. Fortunately on this occasion the liquidity was being withdrawn before the kind of massive imbalances we saw in both Latvia and Iceland had time to occur. I for one, at least, think it's worth considering what happened in Latvia, and what can be learned, in the context of the current EM debate. Another issue worthy of note, as I say in the introduction to this post, concerns the issue of convergence. Historically it has been assumed that per capita incomes in countries forming part of the EU would tend to grow at faster rates than those in richer economies with the result that all member state economies should eventually converge to some common living standards band in terms of per capita income. This now seems unlikely to happen, especially given the demographic and growth outlook on the periphery, Latvia included. The economy is growing well right now, but as we can see it is labouring under severe structural problems (the unemployment rate) and the demographic outlook suggests that growth will now steadily weaken. What we have is as good as it gets. Ironically GDP per capita has been performing well in relative terms since the bust, and in ways the textbooks never envisaged - through a drop in the population numbers. Despite the fact that output is still well below the pre crisis level, as BGG note, Eurostat estimates PPP GDP per capita to now be at 9% above its 2008 peak. Finally there is the point about how the adjustment took place. As BGG explain, the majority of the internal devaluation took place not through wage and price reductions, but through productivity - the mysterious factor X. But is it that mysterious? What happened was that there was massive labour shedding, as unemployment shot up to 22%. Then, as growth resumed, employment didn't follow (mirroring a pattern which arguably we are seeing in a milder form elsewhere, in other countries which are recovering from sharp housing busts). So while output recovered employment didn't which simple arithmetic tells you results in a strong productivity boost. As BGG explain, there was a strong underlying improvement in TFP taking place due to the "catch up" effect, and this undoubtedly helped Latvia in ways we don't yet fully understand. More study would be useful, since again I do think there are things to be learnt. As a last word I would say that if you are reading these lines you have probably struggled your way all through this inexcusable indulgence in verbiage. In which case thank you. You may also have noticed I haven't referred to the issue of fiscal austerity once. Not even a teensy weensy bit. There is a simple explanation for this, the Latvia debate was all about whether or not to devalue, it never was a for or against austerity one. As Paul Krugman puts it: "if we were really looking at an economy with a double-digit inflationary output gap, even the most ultra-Keynesian Keynesian would call for fiscal austerity". 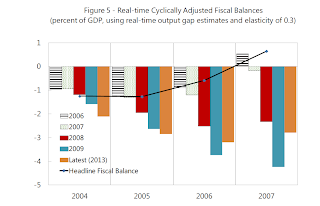 For reasons I have outlined above, I don't fully grant the whole inflationary output gap estimate, but still I think the point holds, this was never about for or against fiscal austerity, since among other reasons it was never about public sector debt. The paper published by Blanchard, Griffiths and Gruss relies heavily on the work of the Latvian demographer Mihail Hazans whose groundbreaking studies effectively forced the Latvian authorities to amend their population and migration estimates. I had the pleasure of meeting Mihail when I shared a platform with him in a colloquium organised in 2012 by the American Chamber of Commerce in Riga. The title of the gathering was, not surprisingly, Latvia's Demographic Future (you can find my presentation here). Basically every country on the EU periphery needs its Mihail Hazans, since we have no accurate or systematic system for measuring these important migrant flows. In response to what I perceive to be a major lack of knowledge and information I have established a dedicated Facebook page in a vain attempt to campaign for the EU to take the issue of emigration from countries on Europe's periphery more seriously, in particular by trying to insist member states measure the problem more adequately and having Eurostat incorporate population migrations as an indicator in the Macroeconomic Imbalance Procedure Scoreboard in just the same way current account balances are. If we don't have the necessary information then how can we hope to formulate the adequate policy responses. If you are willing to agree with me that this is a significant problem that needs to be given more importance then please take the time to click "like" on the page. I realize it is a tiny initiative in the face of what could become a huge problem, but sometimes great things from little seeds to grow. Thanks for the comprehensive analysis. I visit the website regularly. Interesting analysis and website, but I feel you underplay the ethnic aspect of what is happening in much of Eastern Europe. 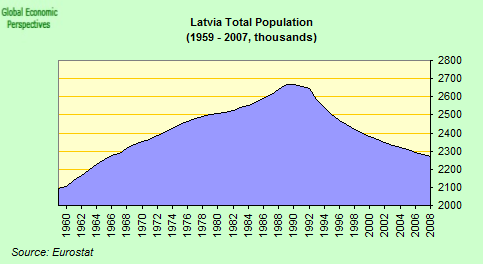 Latvians as a percentage of the population have increased from 52 to 62% between 1989 and 2011. Whereas, Russians have decreased from 34 to 27% at the same time. Most Latvians would no doubt see this positively. Likewise; Estonia (Russians), Lithuania (Russians), Bulgaria (Turks), Serbia (Hungarians) and Romania (Hungarians), to mention but a few, have also seen emigration disproportionately impact upon unwanted ethnic minorities. Many of these nations don't see these demographic changes in just economic terms. For, the Baltic states in particular, reducing the Russian minority diminishes any possible pretext Russia might have to intervene. After all, does anyone remember Cyprus!